Most people are shocked to hear that a video game can actually be more potent than morphine. While this is a phenomenal advance in pain management medicine and for use with burn victims, it begs the question: Just what effect is this digital drug—a digital drug that’s more powerful than morphine—having on the brains and nervous systems of seven-year-olds who are ingesting very similar digital drugs on their glowing screens? And, if stimulating screens are indeed more powerful than morphine, can they be just as addicting? 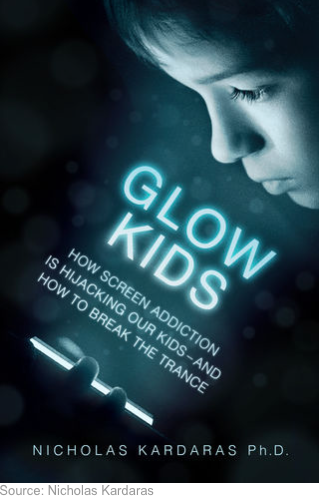 As I discuss in my book, Glow Kids, screen tech can affect the brain just like a digital drug: Gaming raises dopamine levels by 100 percent and activates the H-P-A (the Hypothalmus-Pituatary-Adrenal Axis, otherwise known as the "fight or flight" response). Shockingly, recent brain imaging has shown that excessive gaming negatively impacts the frontal cortex—the executive functioning region of the brain which also controls impulsivity—in exactly the same way that cocaine does. This is why Peter Whybrow, head of neuroscience at the University of California, Los Angeles, calls screens "electronic cocaine" and other researchers call video games "digital heroin." Many of us who research tech addiction and work with screen-addicted kids understand that screens can be addicting. We didn't know that they are so powerful that they can be used as digital morphine. Do you want your child digitally ingesting something that has such a powerful neurobiological effect? He offers no specifics from his research, methods, procedures etc to evaluate whether this is good research. In fact, it has the feel of fake news. Currently, there are those who oppose technology in any form and it seems those are the individuals pumping the media with news about technology that does hold up. In fact, without looking at any data or details I can say that what's being evaluated is not technology but the software. Additionally, it may be not addiction but engagement. What Whybrow calls addiction may be what Mihály Csíkszentmihályi, a cognitive scientist referred to as flow. Flow is a state of engagement where time seems to go by without notice due to depth of engagement. Remember the Harry Potter book that were all the rage when they came out. People were talking about the same kind of negativity because kids found them so engaging. So color me a skeptic.